The ancient and historical city is a favorite for those on holiday as much as it is for history buffs who flock to the gorgeous architecture that has hallmarked the most populous Turkish metropolis. For those who have only a short time between overnight flights, or are just passing through, there are a number of attractions that should not be missed. A Bosphorous cruise is a good way to start the day as it gives a broad and summary vantage of both the European and Asian sides of the canal, and most can choose from a short or long boat-ride – the longer boat-ride actually makes it out of the main city and into the Black Sea, and gives a more authentic experience. Check the church-like Sehir Hatalri ferry terminal for times and availability. Many people flock to the famous Tokapi Palace, and while it is of aesthetic and historical value, if you only have a day or less, it can often like you’re negotiating the crowded lines of a theme park, replete with camera flashes as tourists hustle by without stopping to appreciate the architectural beauty of it – still, it remains an enclave of stories, both libidinous and brutal. The famed residence of sultans, the complex is split into two main courts, but be sure to buy a dedicated ticket so you can check out the harem. Legend had it that at its peak there were over 300 concubines living in the vast quarters here, and was where the sultans could engage in their debaucheries in private. If you prefer something else, then instead check out the infamous Blue Mosque. The iconic minarets and elegantly curved dome have become Istanbul’s signature attraction, and contains one of the largest courtyards of any mosque. While still popular with tourists, the atmosphere here is toned down. Keep in mind that only worshippers may enter through the front doors (there is a side entrance for tourists). 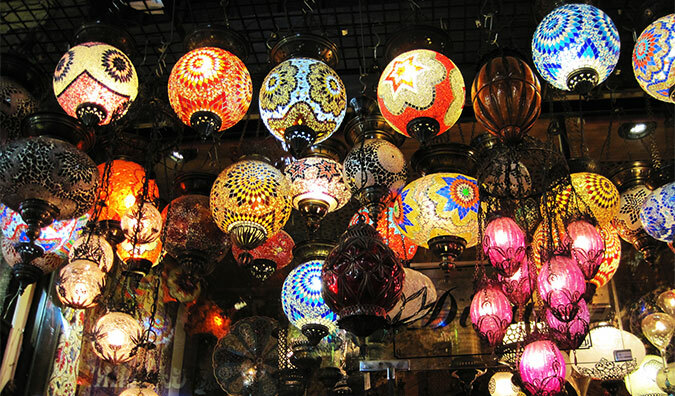 Of course a stop in Istanbul wouldn’t be complete without a trip to the Grand Bazaar. Built by Mehmet the Conqueror in 1461, the centrally located market in the Old City has been a hub of commerce and trade for centuries, and as you step under the vaulted alley ways it’s hard not to feel like you’re stepping back in time, with men and women hawking everything from spices and dried goods to polished silver to those beautiful Turkish lamps. The huge labyrinthine complex contains a slew of different artisans and artisan shops, often hidden in off-alleys or hans – be sure to take your time here as well, as it is often very easy to miss some of the smaller and more unique shops. As well, you might find yourself honing your haggling skills here, and it’s almost expected. It is also an excellent place to enjoy a cup (or several) of tea while conversing with local vendors or simply leaning back to watch the busy day-to-day bustle of locals going about their business.